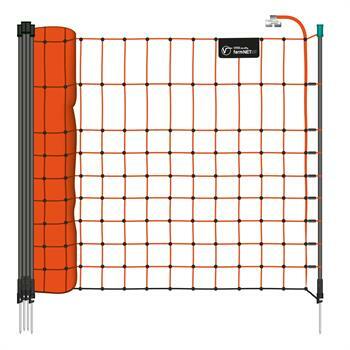 Small animal nets, dog nets and cat nets of the highest quality - "Made in Germany"
If you think that electric netting is only required for large animals, then you’re mistaken. 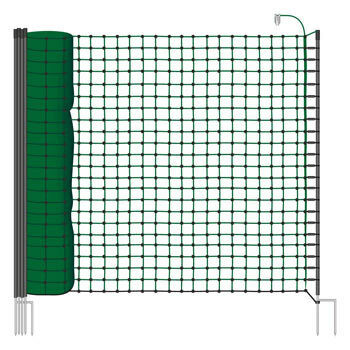 Electric netting for small animals is also a worthwhile investment provided that you buy quality products designed especially for the purpose, such as a Euro-Net. 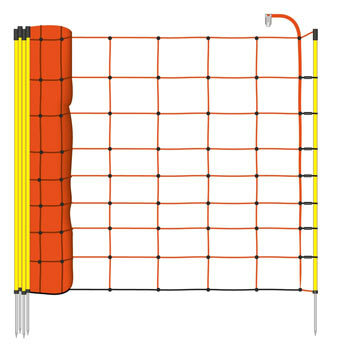 Electrifiable nets for small animals for the garden, field or wood are available in various designs. 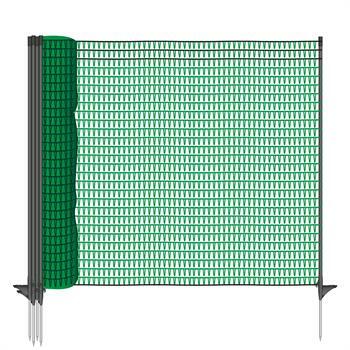 What is particularly important where nets for small animals are concerned? 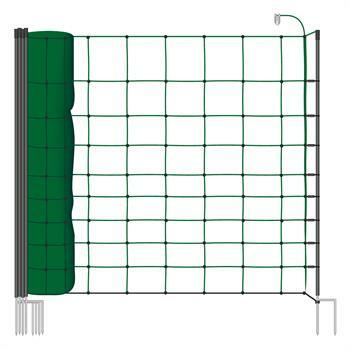 Electric fence or electric netting? 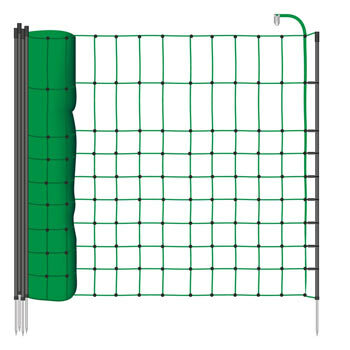 Electric fences are recommended above all for cattle farming and as a defence against wild animals, whereas electric netting offers various advantages for pets, poultry and small animals. Unlike an electric fence, a pasture net not only features horizontal conductors arranged in several rows one above the other, but it also comes with a narrow mesh or, if required, with a broad mesh net. Whereas there is a slight risk that small animals may escape through an electric fence as they may avoid contact with the electrified conducting material, this risk does not exist where electric fence netting is concerned. Nets for small animals with an energiser provide maximum safety thanks to the structure and combined use of a net and electricity. They can also be easily disassembled and assembled and used on a mobile basis, for example if you are travelling with pets, taking part in competitions or transporting small animals. 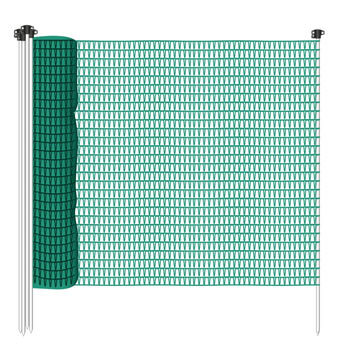 Nets for small animals are suitable for all of this. Pasture nets for small animals fulfil two main purposes: They are used for enclosing animals in their allocated area in the garden or field, while preventing attacks by uninvited visitors from the outside, i.e. wild animals such as foxes. Electric netting consists of several components. The energiser supplies the pet netting, poultry netting or sheep netting with electricity. When the animal touches the net, the electric circuit closes, and a quick electric shock is released. 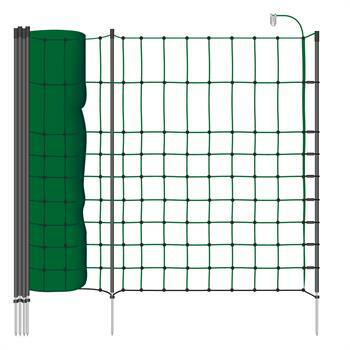 This prevents the animals from escaping through, or damaging, the electric fence net. The fencing itself is made up of posts – generally with double tips – which are driven into the ground at certain distances, and of the rolled-up Euro-Net. This is available either in green to ensure good camouflage or in bold signal colours such as yellow or orange to ensure optimum visibility and constitute a warning. Keep on the safe side, use a Euro-Net for small animals. Unlike an ordinary garden fence, a normal net or a large electric fence, electric netting ensures maximum safety when keeping small animals. 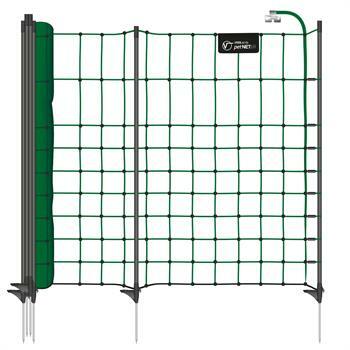 It’s well worthwhile investing in a Euro-Net, made in Germany. The UV-stabilised, hard-wearing and durable Euro-Net with plastic posts, reinforced ground wire and insulated polywire with integrated stainless steel conductors will last for years. It can also be used on uneven terrain without any problem. 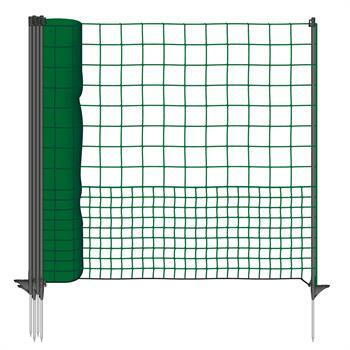 Whether you’re particularly looking for a rabbit net to use in the garden, a cat net or a pasture net, you’re sure to find a model of the right height and length. 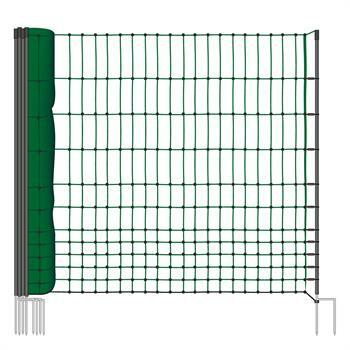 The fine mesh width ensures that hares and other animals cannot get caught or slip through.